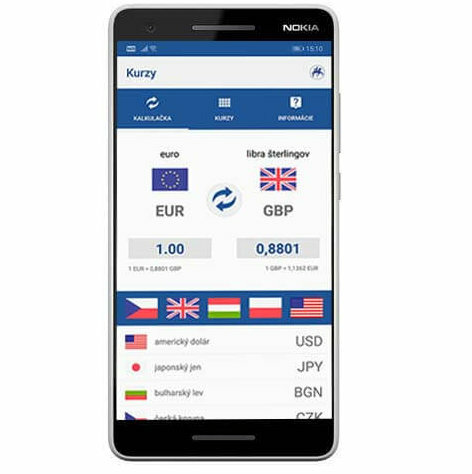 By redesign of the original application “Exchange Rates” and the Xamarin technology as the basic platform, Národná banka Slovenska has gained a modern and user-friendly application for conversion of exchange rates of individual currencies against Euro. Years ago, we implemented to Národná banka Slovenska (National Bank of Slovakia, NBS) the mobile exchange rate application for iOS, which gradually became technologically obsolete and without updates was no longer supported by newer versions of iOS. The application proved to be more and more unreliable what resulted in decision to perform its technological upgrade. to develop an application available for operation systems iOS as well as Android (the application was previously available only for iOS). The common goal of Národná banka Slovenska and our company was to provide users with a modern and constantly available application for conversion of exchange rates of individual currencies against €. This was able to achieve by an upgrade of the “Exchange Rates” app. The user-friendly interface has contributed to comfortable and simple use of the app. display the development of rates of individual countries in the transparent dashboard. To meet the requirement of Národná banka Slovenska to create an application available for both operation systems, iOS as well as Android, we decided to develop the application on the multiplatform tool Xamarin. It enabled development of the application for both operation systems using shared .NET source code, what eliminated the need to develop the application for individual operation systems separately. Among the most significant advantages of the mobile application development via Xamarin we rank the speed of application implementation, user interface nativeness and lower costs as the result of sharing one source code. If you want to have current information on exchange rates at the tips of your fingers, you can download the app via Google Play or App Store.